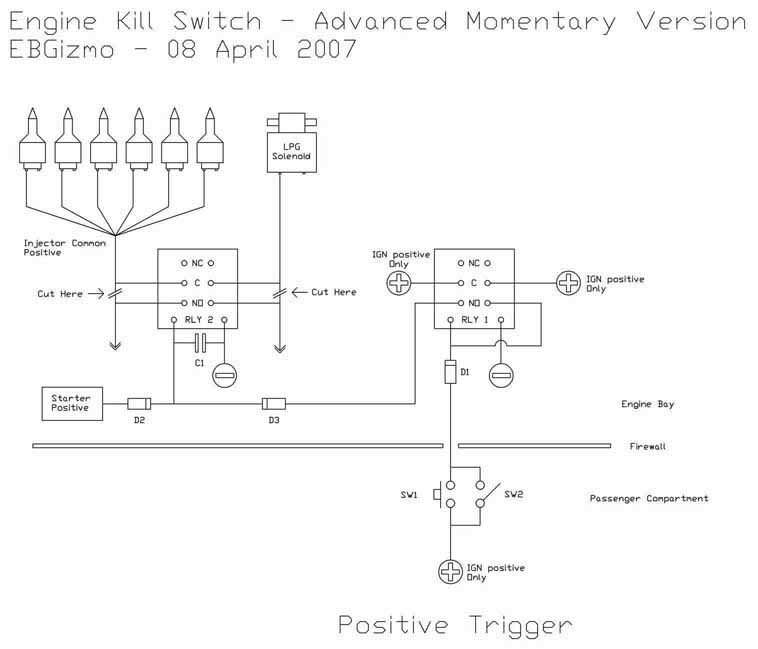 Several people have contacted me requesting information on how to set up a kill switch, so I thought I would do up a document on it, including points and considerations on several ways to accomplish this. These circuits are very basic and use just a handful of readily available components. You will need a soldering iron to build these, as well as a few metres of medium duty electrical wire, and some low duty hook up wire for the relay connections. I wonâ€™t go into specifics on how to build these â€“ rather, I have provided a few schematics that will allow you to set up a kill switch with a couple of handy features, which best suit the driver and his/her particular needs and circumstances. 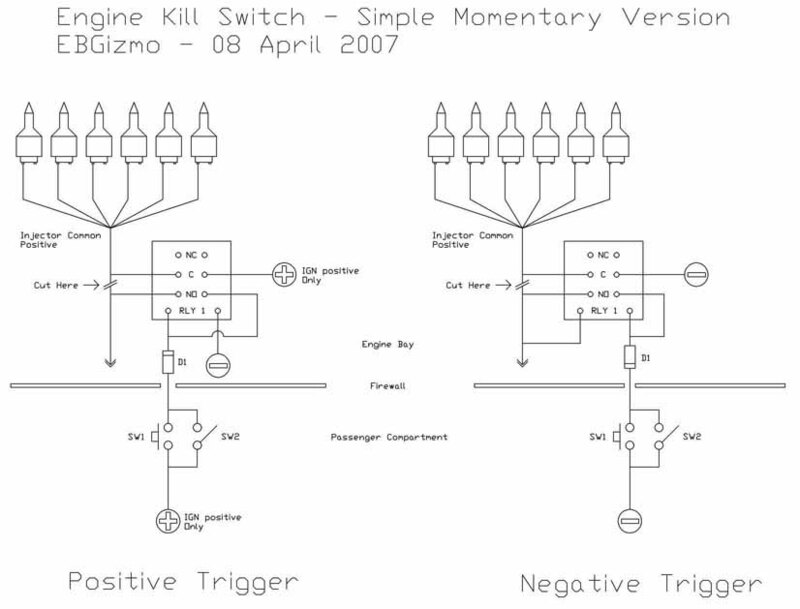 The most obvious kill switch circuit has been left out of these designs. This is simply a toggle switch with two wires going to either ends of the cut circuit. This kind of setup does not give you options such as auto resetting, or cut out after a fake start when immobilised. 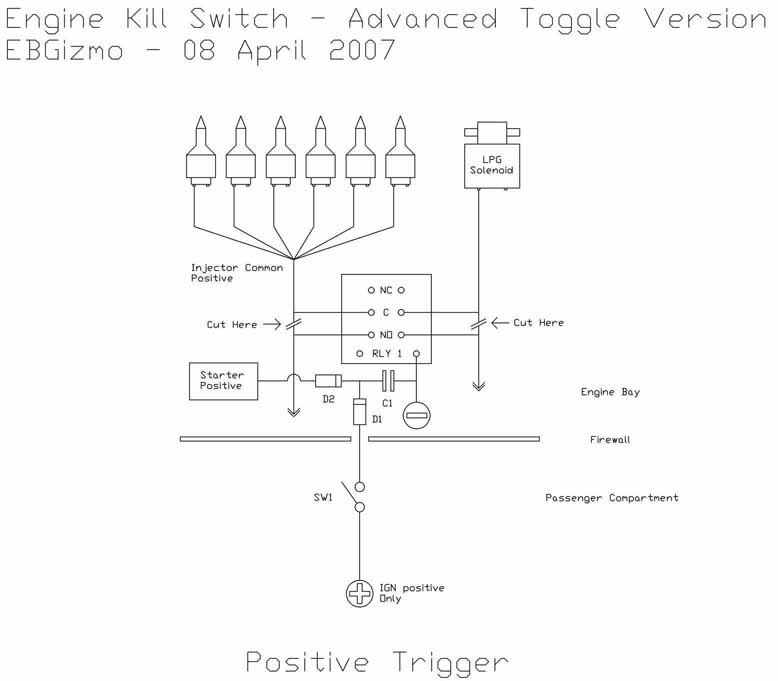 This document will still provide you with information worth considering before installing any kill switch circuit, even if you decide on one as basic as just a switch alone. Each schematic has its proâ€™s and cons, some are quicker and easier to build than the others, some require more connections or relays than others. The security level of each circuit is also different. Some configurations will allow you to have two kill points using just one relay, the more advanced circuits will require more relays to obtain the required functions and multiple kill points. There is no limit to the number of relays that can be added to provide multiple points of immobilisation. Of course, these are just a few examples of what you can do. There is no limit to how you can build these, and you can get any or all of the options going in almost any configuration you require. The reason I have made these six particular circuits is because they are a good combination of parts for what they do. You decide which particular circuit best suits your needs, but if you have a particular set of requirements, or events you would like to be satisfied before a start is possible, contact me and I might just do up a diagram for you if required. I have classified a security level for the circuits, based on how likely it is for the car to be left with the kill switch off. If the security level is 1, the switch must be actively set to turn off the engine. A security level of 2 means that a button or button combination must be pressed before each start cycle, and when the key is turned off, the circuit resets. Circuits rated 1 & 2 have the option of both switches, but in reality, the more switches you have in parallel, the less secure the system, as either can be pressed or turned on. The optional valet switches for the momentary circuits should therefore be hidden in a place that is not easily accessible to the driver, so that it can be set only for maintenance purposes by a non-regular driver. These switches are labelled SW2 on all of the diagrams. Starter motor â€“ A good basic point, this will prevent the engine from even cranking, and therefore running. Most dual point immobilisers will use this, as it does not allow an already running engine to stop. It is therefore regarded as a â€œfail safeâ€ point, in that failure of the kill switch will not leave you stranded on a railway track, or the middle of a highway etc. It is not the most secure of points, however. If you own a manual transmission car, the car can be push started or ran down a hill to get it going, provided the ignition and smartlock can be bypassed. This point is best used in conjunction with another point of immobilisation. Injectors â€“ Probably the most common point used to kill an engine. Will stop the engine from starting, and will immediately stop an already running engine. If you have Dual Fuel, however, you will also need to immobilise an LPG component such as the converter lock-off solenoid in order to remove the possibility of either fuel being used during starting. Ignition Coil â€“ A good immobilisation point. This will prevent the engine from being started, and immediately stop an already running engine. However, it has one big drawback â€“ under the right conditions, it can cause a backfire if the kill switch is accidentally turned off then on again with the engine running. Not really recommended if you want to keep your airbox in one piece, but a good point if you want to prevent the engine from being started in the first place. Use with caution. Not considered fail save. Fuel Pump â€“ Will possibly allow the engine to start (depending on how long it has been sitting idle) but will cause the engine to splutter and stop soon after, depending on a few factors such as engine load, idle time etc. A good point to use if you want a thief to think heâ€™s getting somewhere with his attempts, as long as he doesnâ€™t get too far down the street, or loose power steering and hit a tree when the engine cuts out eventually. Generally a good point, but not reliable on the timing side of things (The Advanced circuits provide a timing option if used). I would decide against this one unless it was used in conjunction with another immediate point of immobilisation, as driver damage can occur to a vehicle that is allowed to be driven for even a short distance. It is also a rather obvious point when you think about it. If a car started spluttering regardless of the full tank being indicated on the dash, the next place a determined thief might look is the fuel pump. Not considered fail safe. LPG Solenoid â€“ Similar to the fuel pump, in that it may allow the car to be started, but on some systems, it may allow the car to run for much longer than petrol would in the previous example. There should be a solenoid in the boot (on the tank), and one near the converter. Avoid using the tank solenoid, as the LPG that would remain in the line is considerable, and can continue running the engine for a substantial amount of time â€“ usually longer than if the fuel pump had cut out. It is important with any installation of this manner that you select quality parts. If you have decided that your installation will be under the bonnet, you will need to select parts that are not vulnerable to heat. Vendors such as Jaycar sell quality automotive relays and bases that are the same as the ones used for the horn, headlight and starter motor relays. These are a good selection if you use any of the Toggle circuits (described later), as only one of these types of relays is required for a single point immobilisation. One main point to consider when installing a kill circuit is the location of the components. It is important that not only the switch be well hidden, but all parts and wires leading to it be placed in a section of the car that is not easy to access. Do not simply cable tie the relays in a spot under the dash where a curious hand might easily find them should it go wandering. Assume that the time it takes you to disassemble a compartment to find the hiding spot for your switch, is the maximum time it would take a savvy thief to find your circuit. For this reason, I highly recommend a spot under the bonnet (away from heat), where it is reasonably hard for someone to go looking without drawing attention. If they can simply lay down and hide in your car with the door shut, they may have plenty of time to wire up whatever they please trying to start your car. Avoid bolting relays to the firewall in plain sight. It will stick out like a sore thumb if the thief opens the bonnet. If, on the other hand, the wires to your kill point have been cut at a spot under the hood (or other secure location), it will be that much harder to hot wire the car without gaining attention. This is provided no other electrical source from the kill point leads into the passenger compartment or other section of the car. For example, itâ€™s a bad idea to wire up a kill switch that cuts the positive feed to the steering column, because all a thief would need to do is supply power back to that wire from another spot inside the car. There are plenty around, and not all of them need a key, so you need to make the cut at a point that is secure and has no other points accessible that can get it working again. An example of an acceptable kill point would be the common positive supply to the injectors (as per the diagrams). This point, as well as many others under the hood, is great if you can lock your bonnet. The injectors, however, are reasonably exposed, but there are other points that are less exposed, such as the fuel pump relay. Once again, if you cut the power to the fuel pump under the hood, the pump can be powered again by supplying it at the tank in the boot, and can therefore be circumvented easily enough. If your remote boot release is disabled (either permanently, or by another circuit) this becomes a different story. The boot now becomes a good place to put your entire circuit. If you use the fuel pump as the kill point, provided there is an LPG tank or similar blocking the rear seat cavity, the only way to get into the boot will be to use a key, or break the lock. In summary, choose a device to cut that is in a location that is secure or can be locked, unless the device is in a location that is very hard to access, or getting to it will take too long or attract a lot of attention. Place the entire circuit as close to this location as possible, and keep the trigger wire running out of it well hidden up to its destination. If too many locations and methods are mentioned here, this document will no doubt get flamed for providing thieves with helpful ways to circumvent a good kill switch location. Therefore, the location to install it is going to be left up to the discretion of the installer. Think it through, and once you have an idea of a good location, map it out, and then think to yourself, â€œWhat would I now need to do to start this car?â€ The saying is true â€“ in order to beat a thief, you first have to think like one. Do you want family members to know the location of the switch? Do you want to stop certain family members from driving the car? Is it likely you will forget to arm the switch after you leave the car? Would you prefer not to have to worry about setting the ignition kill if you stop and start your car often? Looking at the table of features in the introduction, you may be able to better decide what circuit is going to meet your needs. There are two basic designs to choose from â€“ Simple and Advanced. Simple - Only prevents the engine from being started through the injectors, or other cut-off point suggested previously. Advanced â€“ Allows the engine to be started, but will make it cut out soon after. The time delay is determined by the value of the capacitor used (C1). Of these two designs, you can further decide if you want to build a circuit that uses either a Toggle (on/off) switch, or a Momentary (push button) switch. Toggle Switch - When the switch is left in the ON position, the engine will always start. When in the OFF position, it will crank only (Simple), or start and then cut off (Advanced). Secrecy: The location of the switch may be known only to one person, and the car can be lent to others to drive without the location of the switch being known to the person borrowing the car (Valet mode). The driver can forget to set the switch when locking the car, and the car would be easier to steal. Momentary Switch - The switch must be pressed once before each ignition cycle in order to start the engine. The car is more secure, as pressing the button is now a requirement and can not be forgotten (unless the optional valet switch (SW2) has been installed and left on). 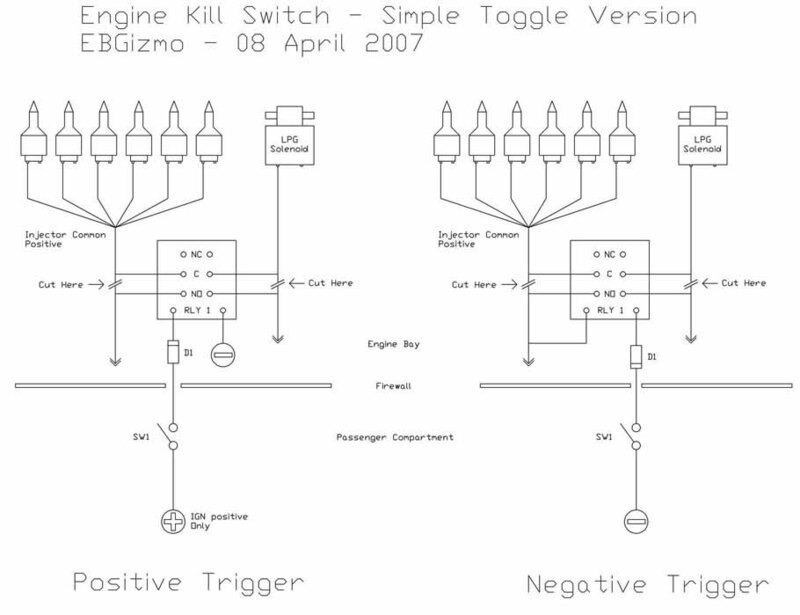 Setting of the kill switch is automatic on engine stop. You will need to disclose the location of the switch to anyone who drives the car, unless you have also installed the optional valet switch in parallel with it. Having multiple â€œORâ€ switches lowers security, but allows you to keep the momentary switch location a secret. Both of the Simple circuits support either a positive or negative switch trigger. The positive trigger versions allow you to use existing positive switches or signals (such as the brake pedal or high beam) as a â€œghost switchâ€, instead of using a dedicated hidden switch. You can of course connect dedicated switches of any number in series, or a single ghost switch and an unlimited number of dedicated switches. This would then require all of several conditions to be met before starting is possible. This setup is only practical using the momentary circuits, as you canâ€™t always leave on all your switch signals when driving (brakes, high beam etc). Of course, using the high beam or brakes as a signal is not a very good idea, as most people are already pressing the brake at the time of engine start. In addition, if a thief tries to steal your car at night and turns on the high beams, he has foiled your switches entirely and didnâ€™t even have to think about it. The same above rules apply to the negative triggered versions, but these have another benefit. If you use these circuits over the former, this will make finding a trigger power source easier. You will only have to run one wire to them from the circuit, and supply the switch with a ground source nearby. Using the positive triggered circuits is highly recommended, as you have many more signalling options throughout the car. Note the direction of the diodes when installing them (if required). If they are inserted the wrong way, certain features may not work, or may interfere with other features or switches. The value of C1 is gained by adding as many capacitors in parallel as required. A value of approximately 470-1000uF using the SY-4008 relays will give a good splutter of the engine, then cut it off immediately. If you use the automotive relays (or more relays with their coils in parallel to give more kill points) you may need to increase the number of capacitors to get the desired delay. The aim is to get the motor to kick over for a brief moment, not let it run for several minutes â€“ although getting it timed just long enough for a thief to adjust his mirrors, put on his seatbelt, and adjust his seat will provide for great entertainment if you happen to be watching. This might be frustrating enough to make them move on. Also note that the relay contacts on the circuit diagram may be different from those of the physical relay. Always use the contact labels (C/NO/NC) on the circuit diagram to match up to your relay, rather than matching the relay up to what the picture looks like. You will notice that on the SY-4008/4065 relay, the Common and Normally Open contact positions are opposite. This is because I draw my relays the same way I draw my slide switches. Double check all connections before installation and you shouldnâ€™t run into any problems. Document written by: EBGizmo on 26 2007>, Copyright © 2007 EBGizmo, all rights reserved.